Welcome back to Pan Ambling. The Games are now less than two weeks away, so I thought it would be nice to build on your excitement by sharing some fun facts I’ve learned in my research so far this summer. The Pan American Games, much like the Olympics, happen every four years. Did you know that the first, and only, Winter Pan Am Games were held in 1990? Argentina hosted 8 nations and a mere 97 athletes for 1 sport — alpine skiing. Canada and the United States were the only teams to win medals. Go Team Canada! It’s funny to think of a Pan Am Games that showcased only one sport! Image Source. The Pan American Games have been hosted across the Americas since 1951. Which is why it might surprise you to learn that the Parapan Am Games came to be a mere 16 years ago in 1999. Toronto is hosting the 5th Parapan Am Games, with the largest amount of para-athletes yet — estimated at 1,600 — 300 more than in the 2011 Guadalajara Games! In the video below, you can get a better idea about how our Parapan athletes prepare for the Games. Learn more about the history of the Paralympic movement on the Toronto 2015 website. This year’s Games will be the largest multi-sport event ever hosted in Canada — even surpassing the Olympic Games. I found this quite surprising, personally. The GTA will host competitions in 40+ venues. One of them — the Toronto Pan Am Sports Centre — is the single largest investment ever made in amateur sport development in Canada. When the Canadian government says this year’s Games will leave behind a sporting legacy, it knows what it’s talking about! Two sports, Golf and Women’s Baseball, will be debuting at the Toronto 2015 Games. This year’s Pan Am Games features a new 35-day arts and culture festival, PANAMANIA, which encompasses four major programs and more than 250 unique performances and exhibitions, many of them free! You can learn more on the Toronto 2015 website. The new Toronto Pan Am Sports Centre, which is co-owned by the City of Toronto and the University of Toronto. Aside from the pools, it also includes a separate dive tank, fitness centre, climbing wall, indoor track, and Games-time capacity for 10,000 people! Image source. Another first this year is the use of a centuries-old process called “mokume-gane” by the Canadian Mint. This technique fuses different alloys in the creation of the medals. Mokume-gane, according to Wikipedia, was first used in the 17th century to create traditional samurai swords. Now our athletes can feel like warriors! 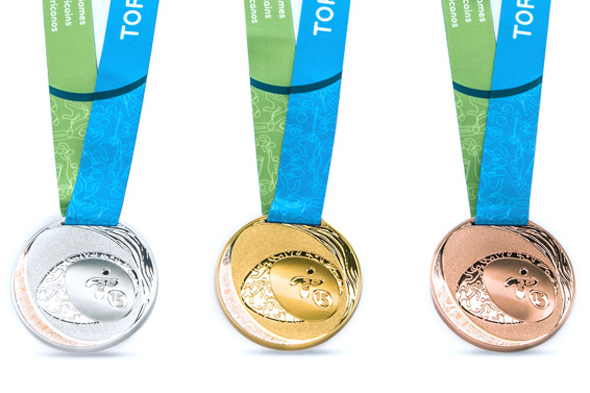 Aren’t these medals just beautiful? You can see familiar Pan Am “in motion” icons on both the medal and it’s strap. Image source. What other fun facts have you heard about the Games? Which were you most surprised about? Excited about? Let’s chat! Comment below or tweet me @yorkustudents.